Sabaidee! 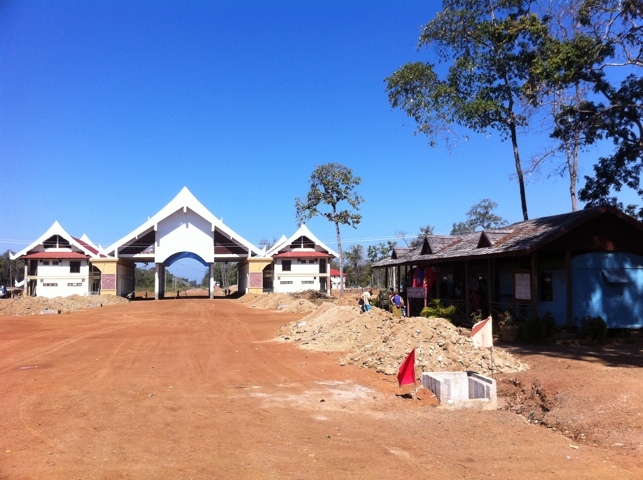 We’re at the Laos/Cambodia border, having just crossed on our way south to Phnom Phenh. It’s baking hot, and we’re all sheltering in the shade by some food stalls while we wait for the rest of our busload of people to come across. The border itself was a masterpiece of red tape and petty corruption. First we stamped out of Laos, with a $2 unofficial ‘stamping fee’ each. Red ink sure is expensive! We then traipsed over to Cambodia, where there was a mandatory health check ($1, you hand in a form and they quickly point a temperature gun at you). Finally, we got stamped in to Cambodia, ($2 ‘tea money’). This is after we’d already sorted our visa out in advance! There are a few folks who nobly resisted paying the charges – a couple who apparently took a series of photos of the border guards obviously extorting money. We heard them shouting (which is never a good idea here) that they were ‘going to call the Dutch police’, although I’m not quite sure what jurisdiction they think they’d have! According to a guy who’s just come through, they managed to get through in the end without paying, but the border folks would only return their passports after they deleted the photos. 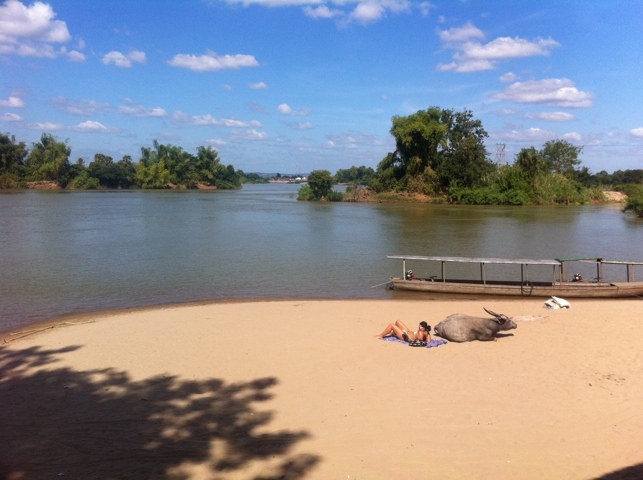 The Laos side of the border. On the left, the new border post, on the right the slightly less impressive current one! We’ve spent the past few days in Si Phan Don, otherwise known as 4,000 islands. It’s an archipelago in the Mekong river, just on the Laos side of the border, the islands are home to a set of bamboo bungalows that epitomise the Lao moniker ‘Land of the lotus eaters’. It’s a place where being horizontal is the customary way to spend your time – and who are we to fly in the face of tradition? Or so we thought! It turned out that we had a somewhat more active few days than we’d planned. When we first arrived on our isle of choice, Don Det, we ended up on a 2km trek to find accommodation with a twin room. Although the walk was a bit draining in the tropical midday heat, we were pretty happy with our choice – a new place overlooking the river where we were the only guests and it was very quiet. However, we hadn’t quite anticipated this meant each day we did at least one hour long round trip into town at the other end of the island. We also got in some additional exercise sightseeing to check out the legacy of the French’s use of the islands. A couple of small islands are not the usual place for a country’s first railway, but the French were determined, and built a 5 km track across two bigger islands (with a bridge between the two), as well as a couple of piers to load and unload goods at each end, and a rusting locomotive. Quite why they didn’t just sail along the river instead of the elaborate engineering, we don’t know. It is a testament to Laos’ non-participation in the industrial revolution that the railway was abandoned when the French left after WWII; until five years ago the country had no track whatsoever, and after Thai effort, the country is now the proud owner of a huge 3km of track, which then heads off into Thailand. Now that’s a miniature railway! Buoyed by the success of our waterborne experience in Ha Long Bay, we signed up for a day’s kayaking in the Mekong. Setting off early in the morning in a flotilla of six yellow plastic boats, we paddled downstream to (but not actually down) the impressive Tat Somphamit waterfalls, which the locals believe trap spirits as they go over. 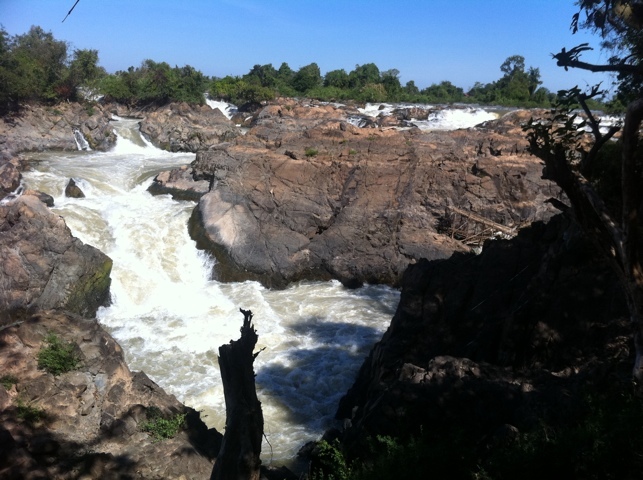 We then splashed on through rapids and across the Mekong to a spot of lunch in Cambodia (no passport or red tape required, fortunately), before re-embarking on the water to see dolphins. Perhaps it was the karma from eating tuna the previous day and not checking it was dolphin friendly, but as we got closer to the middle of the river (and this is a very wide river, perhaps 1 km), we had the feeling something wasn’t quite right. In other circumstances one might call the ‘impending sense of doom’* we had a ‘sinking feeling’, and as it was, that was just about right! Laura and I are not experts in kayaking, but we did realise something was wrong when the water was quickly high enough to wash over the side of the craft and all of my lower body was submerged! The swishing sound of the hollow cavity below us quickly filling with water didn’t exactly inspire confidence either. 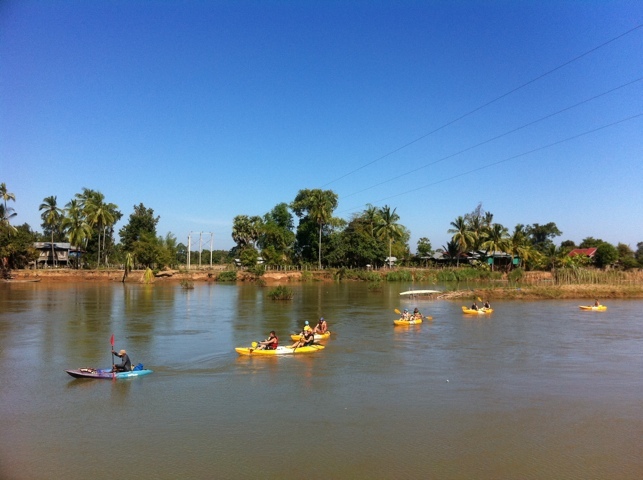 Fortunately, this was the perfect opportunity for us to put into practice our speed paddling skills, and we made it back to the dry land of Cambodia just before we found out the hard way what it would be like to be in a yellow submarine! In a comic discovery, it turned out that the plug had come out of our kayak, and we were half full of water. We’re not sure why they have a removable plug but at least it meant we could get the water back out again! After 15 minutes of emptying and a repair using a crisp packet, a twig, and some elbow grease that Heath Robinson would be proud of, we were off again. This stretch of the river is famous for its population of rare Irrawaddy freshwater dolphins, and having refreshed our luck through the near-sinking, we were fortunate enough to catch sight of quite a few of them. This time we drifted on the surface, and every now and again one of the silver-coloured creatures would appear, sometimes just a head popping up for air, but quite often we saw a graceful grey arc, their distinctive curved side fin sticking straight up as they dived back down. Sadly their numbers are diminishing, mainly due to various government dam projects – but refreshingly, not fishermen, who revere them as protectors from crocodiles. Fortunately we didn’t see any of those! We all bundled into the back of a large vehicle (more truck-truck than tuk-tuk) for the journey back, stopping en route at the Khon Phapheng Falls, the largest in South East Asia by volume, and probably the biggest we’ll see until Iguazu in South America next year. With ice creams in our hand, we watched the millions of litres pouring down over the rocks and celebrated a successful outing, with just enough drama to make it exciting. This woman was sunbathing, and the water buffalo was in the water. Brilliantly, it then decided to sit right next to her, much to everyone's amusement! 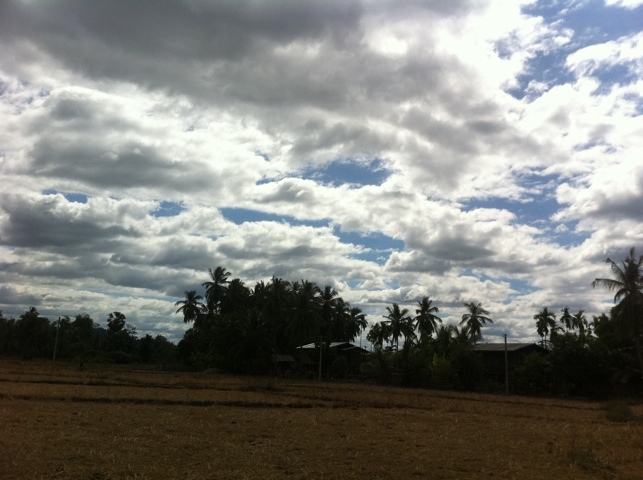 And so we leave Laos! It’s a place we’ve really fallen in love with, a pace of life that’s refreshingly calm, with an innocence and friendliness like nowhere else we’ve been. 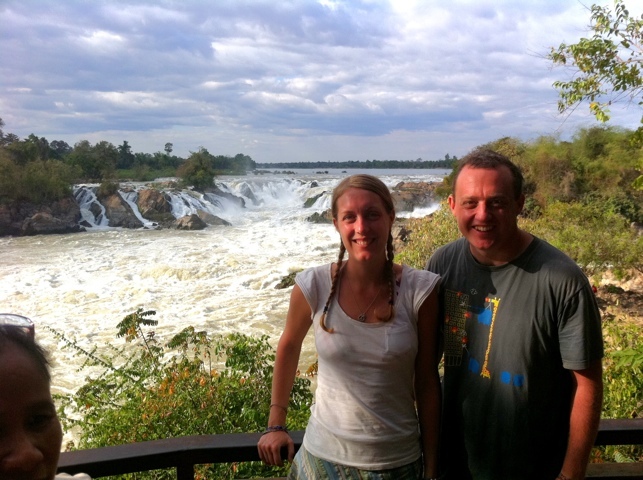 It takes a little while to adapt anywhere, and Laos was no exception. We’d soon coined the term ‘Laos option’ to refer to a quirk we’ve found across the country – places frequently advertise things that don’t exist. This might be a guesthouse with a sign saying ‘vacancies’, only for you to trudge up to the desk and be told ‘all full’, or the bus ticket the travel agent doesn’t sell in spite of the big poster behind him, or most common of all, the non-existent restaurant menu items – for example papaya salad, the ‘national dish’ apparently as well hidden as the Ho Chi Minh Trail! This was confirmed by one guesthouse owner, who we overheard telling some friends how her chef had insisted on putting papaya salad on the menu despite never having papayas in stock. His reasoning? ‘Once they’ve sat down to eat, they won’t go elsewhere.’ So perhaps not quite so naive a country after all! We only wish we had longer here – its been a lovely few weeks, and we’ll certainly be back for a second helping at some point in the future, even if the papaya salad isn’t available. * also a side effect of Lariam, the anti-malarial drug we’re taking. I don’t think sinking is on the list though! Making our way into town on the back of a converted pickup truck after the journey from Hanoi, we could immediately tell we were going to love Laos. Vientiane is the capital city, but feels more like a sleepy village – the streets wonderfully quiet and absent of the chaos of motorbikes and honking horns we’ve come to accept elsewhere. There are pavements, giving it an air of sophistication, and no litter, which has plagued some of the places we’ve been. I could see Laura positively beaming as we passed various fountains on the way in to the centre – fountains which were actually filled with water and working, unlike most we’ve come across on our journey. 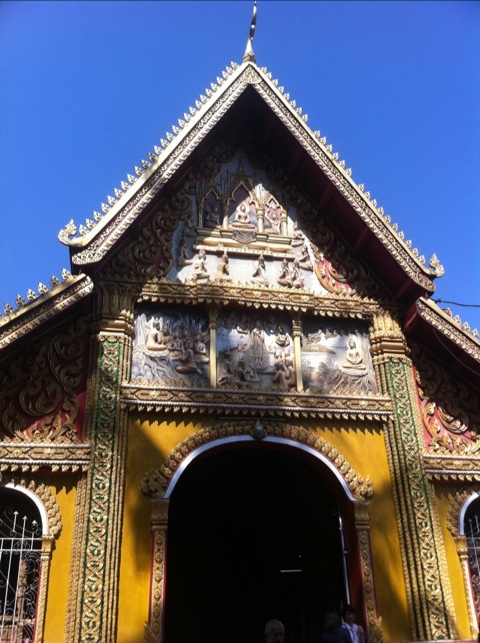 The other immediately obvious thing are the temples, or wats, whose golden gleaming beauty and multi-headed serpents are unlike anything I’ve seen before. Being just over the border, I gather they’re quite Thai in style, very different to the Buddhist temples and stupas we saw in Tibet, even if their was some familiarity in seeing monks wandering around in their robes – now Guantanamo jumpsuit orange instead of the deep red of the Himalayan orders. The speed dial here has been turned down to ‘laze’, echoing the Laos attitude that everything must have an element of fun to be worth doing, and reflecting the pace of life in a country that until the nineties apparently had no road connection to the world outside. Smiles are in abundance, and although certainly not naive about tourists (which are as common as those smiles), you don’t get the feeling people are after your money at every turn, which we’ve certainly had elsewhere. 60 kip (£5) for an en suite twin room at the Lao Youth Inn, an absolute bargain and our cheapest yet! Escaping from the backpacker village that comprises some of the town centre, we went off seeking sights, and soon found ourselves with two very different snapshots of the national psyche. 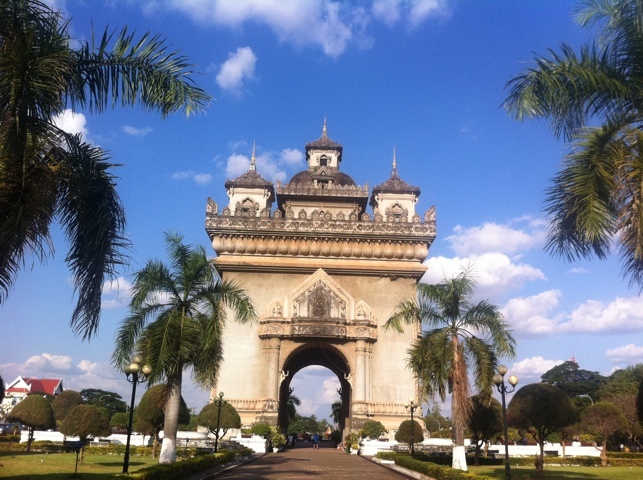 The Patuaxy, or ‘Arc de Triomphe’ sits in the middle of Vientiane’s central boulevard, a towering echo of the more famous Parisian monument. It’s huge, at seven stories high, and the views from the top formidable (once we’d passed through no less than four gift shops on the route). It’s also known as ‘The Vertical Runway’, as it was actually built using cement given by the American Aid programme in the sixties for the construction of a new runway at the airport! As we found out, Lao’s relationship with America became pretty loveless during this time, but this it was an interesting reminder of how aid can be diverted. 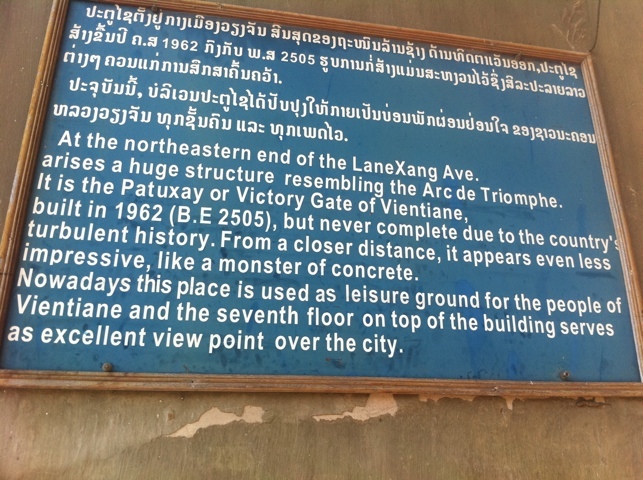 The sign at the monument itself also has a touching imprint of Lao honesty and naivety about western notions of marketing. One hilarious sentence reads “From a closer distance, it appears even less impressive, like a monster of concrete”. Our other snapshot of Laos life was decidedly more sombre, with a visit to the local NGO COPE, the Cooperative Orthotic and Prosthetic Enterprise, which works with those who have lost limbs. 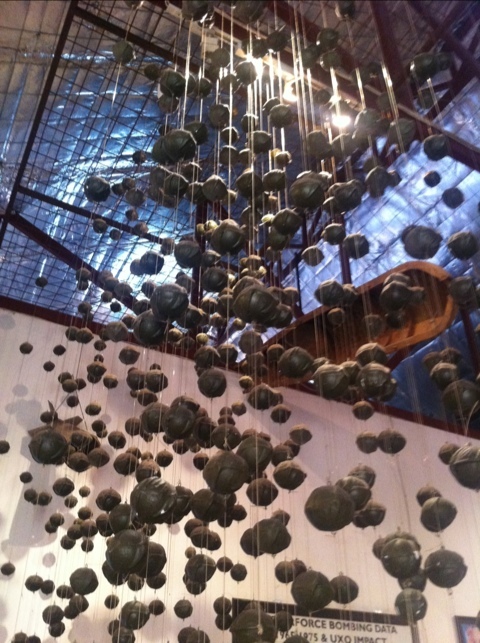 Going round their permanent exhibition, we learned about UXO, or UneXploded Ordinance – Lao has the grim title of being officially the most bombed country on the planet, with America’s ‘secret war’ in the country happening alongside the more public atrocities in Vietnam. 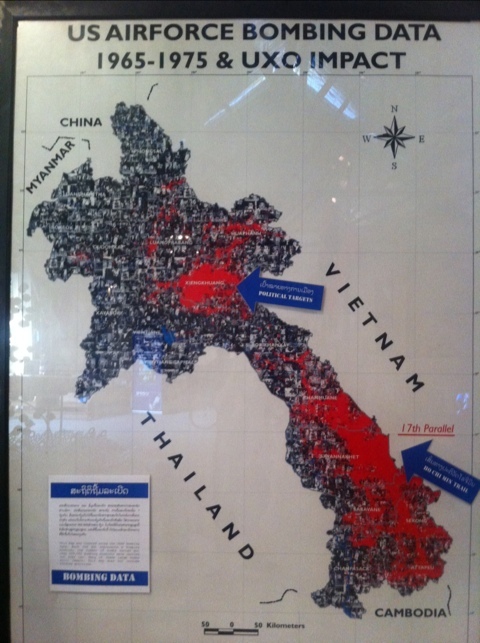 A red dot in the picture below indicates each bombing sortie in a war that was being officially denied by the US – targeting the ‘Ho Chi Minh’ trail into Vietnam, as well as political targets in the ‘Plain of Jars’ in the north of the country. According to official US figures, 2,093,100 tons of ordinance were dropped over 580,944 sorties, equivalent to one B52 bomber every six minutes over the nine years of the war. Notwithstanding the civilian deaths from the campaign itself, 1/3 of the population became internal refugees, and the legacy of the cluster bombs dropped still kills one person in rural Laos daily. It’s believed that 30% of the submunitions didn’t go off, leaving millions of grenade-sized bombs scattered in the countryside. Tragically, in recent years the cost of scrap metal has risen, with many poverty-struck villagers and especially children now trying to make money harvesting the metal planted by war. Half of reported UXO accidents happen to those trying to salvage munitions. Despite the efforts of the UN and mine clearance organisations like MAG, at the present rate it will take another 200 years before Laos is clear of this horrific legacy from decades ago. And all this from a war that didn’t exist. Wats, and then wander in the brilliant afternoon sunshine down to the Mekong river, where we met some monks strolling along the sandy bank. We had a lovely chat with them, inquisitive about our lives back home and what temples we worship in. We explained the ‘Christian Temples’ attended by some on Sundays – the concept of many being non-religious is always a tricky one – and also a little about our trip around Asia, particularly Tibet. Both aged 21, they were keen to practice their English and we had a great time – even if we weren’t able to get much out of them about their lives and whether their calm smiles of the street extend within the monastery walls.